Despite an early 16 point deficit, Concordia’s women’s basketball team stormed back and dominated the second half of their semi-final matchup, beating the Bishop’s University Gaiters 65-53 at Loyola Gym on Tuesday. It didn’t look good early on for the home side as Bishop’s forward Riley Shkimba banked a three-pointer to give the Gaiters a whopping 24-7 lead at the end of the first quarter. The Stingers routinely turned the ball over, seeming to have no answer for the Gaiters’ prolific attack. To Stingers coach Keith Pruden, it was simply a matter of execution. 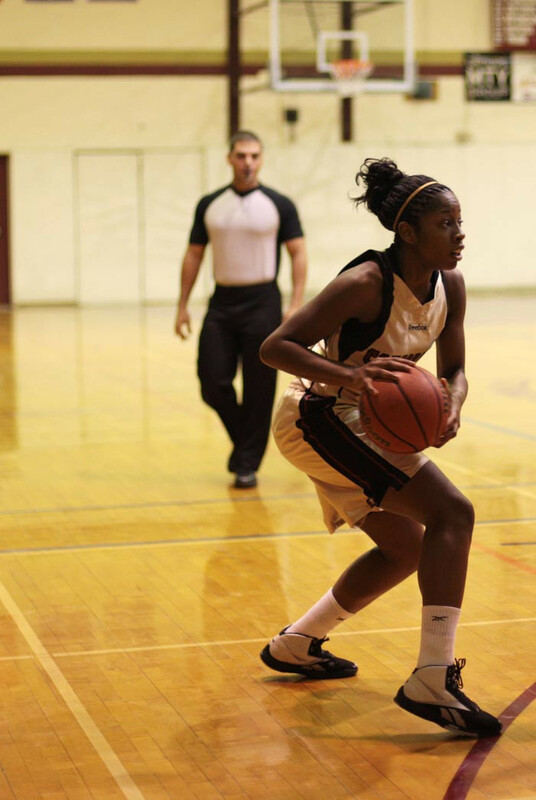 Stingers league MVP guard Kaylah Barrett led the charge for the home squad, scoring six consecutive points to bring the Stingers within 12 in the second quarter. With an average of 20 points per game, the highest on the team, she provided ConU with the star-power they needed to make it back to the Quebec Conference Final for the first time in eight years. “[Barrett] has the potential to be the best Concordia athlete I’ve had on my team,” said Pruden. For the team leader, who heard chants of “MVP!” at the free-throw line in the fourth quarter, quitting was never an option at Tuesday’s game. “If you’ve watched our games, you gotta see that for some reason we’re always down in the first half, but we always manage to pull it out,” said Barrett, who finished with 21 points and 11 rebounds. The Stingers took their first lead of the game in the fourth quarter on a layup by forward Tina Mpondani to put the home team up 33-31, and it was a lead they would not relinquish. Thanks to the play of Barrett and Mpondani, who finished with a double-double consisting of 15 points and 12 rebounds, the Stingers cruised through the fourth quarter. The Stingers face cross-town rivals McGill on Friday in the conference championship game. The teams are familiar with each other, having split their four regular season games. “We know [McGill]’s as athletic as us, so they’re going to run with us, but like I said, they know us, we know them, so it’s going to be a tough game,” said Barrett. For coach Pruden, there is no rivalry quite like it. The action takes place March 2 at Love Competition Hall. Tipoff is at 7:00 p.m.